One focus of PC design is towards the smaller form factor. While mini-ITX is the standard ‘small’ form factor, Apacer is starting to sample their Combo SDIMMs that add storage functionality to the DRAM module (Storage + DIMM = SDIMM in this case, or so it would seem). The idea is to remove a bulky storage device attached via a cable and migrate it to another PCB – in this case, the DRAM module. Note this means this is not extra DRAM, just two different devices on the same PCB drawing from the same power source. These modules come with either an M.2 slot, supporting 2242/2260/2280, or a CFast memory card. Both options are still connected to the SATA interface, although they draw power from the DRAM slot rather than the motherboard directly. Apacer is thinking that users who want M.2 or CFast capabilities can purchase these combo modules and connect them without having to upgrade. Or alternatively, in order to reduce bulk in the system. While reducing bulk in ATX might not count for much as there is plenty of space to play with, it makes more sense on mini-ITX. Only one mini-ITX motherboard supports 2280 M.2 drives, the ASUS Z97I-Plus, but at the expense of extra routing and PCB layers to place it on the rear. Apacer is also quoting potential use in embedded devices, with M.2 support up to 256GB and CFast to 128GB. If an embedded device manufacturer goes custom then soldering on DRAM and adding an M.2 slot negates this new technology. The main application for Apacer, as quoted in their press release, would seem to be towards the Internet of Things and also the suspected wave of upgrades to appear now that Windows XP has officially stopped patching security flaws for regular license holders. 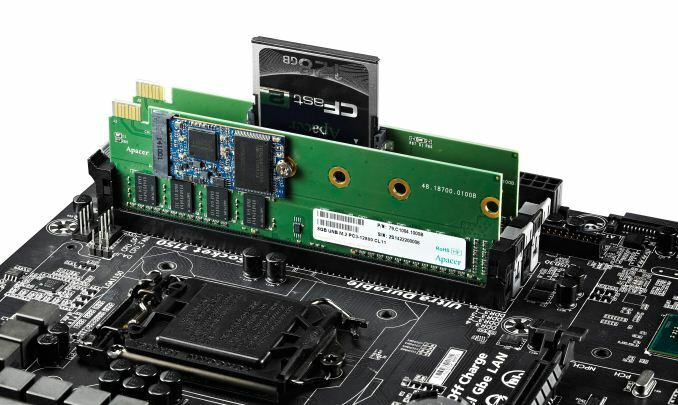 This Combo SDIMM adopts the DDR3 standard (I would assume DDR4 might be around the corner as well), and takes advantage of the VLP DIMM PCB design (0.748-inch in z-height) for the memory chips. Size or speed of the actual DRAM on the module is not quoted, although given the image we have access to, it would look like there will be at least 8 GB modules running at DDR3-1600 CL11. One could argue that 4x8GB of DRAM with four M.2 drives saving space could be a good thing, or even more in an X79 system. Note in the image above there is an SLI-like connector between the modules - this is presumably the SATA connector. For the motherboard in the image, it would seem that the smart orientation would be the other way. Apacer is now sampling customers for evaluation, which would point to an OEM only release for workstations or SFF systems. One of the stranger looking things I've seen. Don't see how sticking it on the RAM module is any better than just sticking it on the motherboard itself. Unless they made it not taller than normal. But your board height is limited by your heatsink Z height as well. It would work for non Thin-ITX motherboards where the height limit is the height of a standard HS/F, but where you want additional storage without having slots for it. "no mini-ITX motherboards support 2280 M.2 drives without using an M.2 to SATA connector"
They should have added a jack to charge my phone too.